The Treasure Chest is an assortment of premium-grade realistic resource tokens for use in a variety of games. 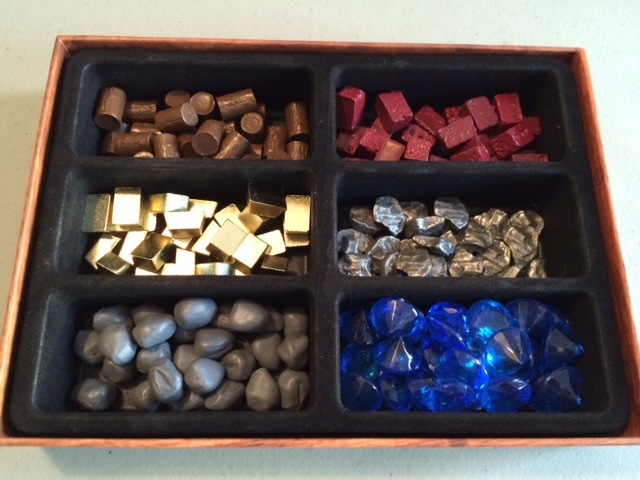 It includes tokens for wood, stone, brick, gems, ore, and gold. Many of the tokens originally found in the Treasure Chest are available individually Top Shelf Gamer and at other retailers. The origin of the Treasure Chest can be found on this blog entry and poll as well as here. You can also find a full list of games that use these types of resources here. 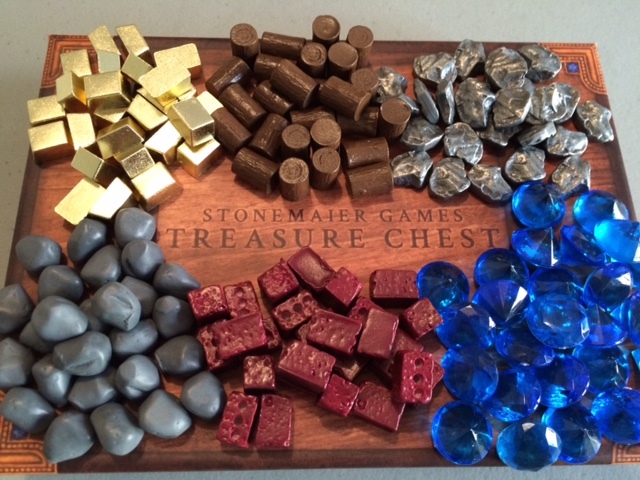 The Stonemaier Games Treasure Chest funded on Kickstarter in July 2014. I was a bit burned out on KS when this was up, but I’ve been playing my KS editon Euphoria and really digging the bits, so I’m taking a second look at this to pimp out my Tzolkin mainly. Will this be available through any retailers, or just direct from SM Games? Damon: Yeah, I can’t wait to use this in my copy of Tzolk’in too. :) It’s only available directly from Stonemaier Games. but i suggest to re-paint the 3. top row resource, the small iron nuggets to gold/yellow. The 5. low row, the bricks in grey. And the wooden ressource, paint the the ends a bit lighter. Then it fits totally to Tzolkin, ’cause you have gold nuggets and cuboid? stones. I played Prosperity with these using the play-to-win copy at Conncon. I never thought I’d be in the market for something like this, since I generally don’t upgrade anything in my games, but these are such good quality that I’m now here posting an unsolicited comment so that anyone who is on the fence will pick these up. The gold/ore especially are so satisfyingly HEAVY that they really add to the game. We used those as money, and put the blue gems on our prosperity points to see what was going to score. These are now in my cart for my next game order, since I unfortunately did not win the play-to-win. Great job! Hey Jamey, I just bought a second copy of the treasure chest so I could have enough pieces to cover all my games. I’ve found that the box JUST barely fits two sets in one (there are maybe 5 plastic gems that have to spill over into another tray with the ore or stone bits). Is there any chance you might size the new treasure chests to fit the same, or maybe just a few percent bigger? I’d really like to pick up two copies of the full set of three when you do the kickstarter, but keep the original boxes double filled like this one. Thanks again for all the cool stuff you make! I own everything you’ve made so far – and it’s all the same high quality. Anthony: Thanks for buying multiple treasure chests! 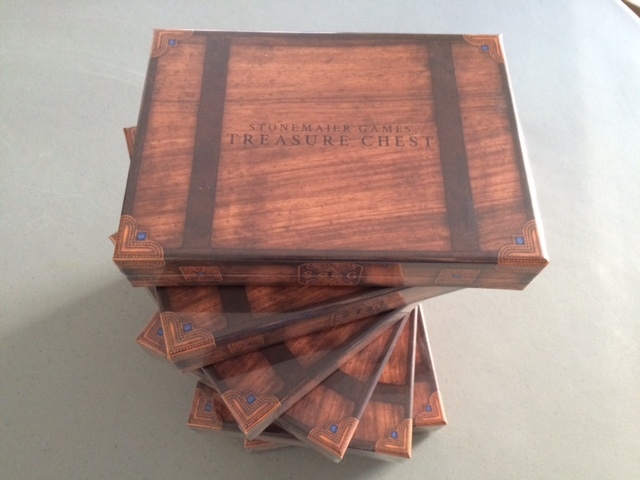 So, for the new chests (Food Crate, Resource Vault, and Energy Box), the boxes will be the same size, but we’re moving to a new insert with curved sides (see here: https://www.kickstarter.com/projects/jameystegmaier/treasure-chest-realistic-resource-tokens-for-board/posts/1186936) to make it easier to scoop tokens out of the compartments. That means that fewer tokens will fit in the container. However, our stretch goals for the new project give us to the potential to go up to 30 tokens per resource (we’ll start at 20), so it’s possible there will be more of each token in each of the new chests than in the original chest. Just got my original treasure chest and was able to get it to my local game night for a game of Stone Age. It was well received and just makes the game pop that much more. Lost to an opponent who was able to, on his last turn, build a solid gold hut for way too many points. This hut was made all the more awesome with the gold bricks included in the chest. David: I own the molds, and I gave Panda permission to share those sample tokens as examples of the types of things they can make. The problem is, the wood token that’s included with Scythe look much better than the original design to me. Is there way for me to buy a full set of the new design wood tokens somehow? thanks for the answer! Are they also obtainable in Europe/Germany? It seems that my “big” game store/retailer that has everything else in stock from every game doesn’t list your treasure chests and yet also no realistic resource tokens for Scythe, but he is selling the metal coins for Scythe. What would be the best way to buy the tokens in Germany? Tell the retailer to order at Top Shelf Gamer? Or is there any other distributor for Germany? Or would it be easier to place an order at Top Shelf Game myself and import the tokens to Germany? Top Shelf will be offering delivery worldwide for these tokens, either directly through them or through fulfillment partners in Europe, Australia, and Asia. You can also have your local retailer purchase the tokens from Top Shelf Gamer (in bulk) to sell to you. Is the token box (Treasure Chest box) still available to purchase anywhere?